Today we are having a chat about the small but mighty Batiste XXL Plumping Powder. I'm telling you now guys, if you hair is a bit flat and a bit meh, you're gonna need to try this little pot out. I was in Boots having my weekly browse and remembered I needed some dry shampoo so you know wandered to the isle and noticed it was on a buy one get one free across the whole Batiste range when I spotted the XXL Plumping Powder. One thing you need to know about my hair is that it is bloody fine! It's not that I don't have a lot of it, I do, but each strand is very thing so it looks super flat which I have hated more and more recently. I have tried a LOT of shampoos and conditioners claiming to work wonders, it's all crap, they don't work so i just gave up and cracked on with my normal hair regime. That was until I saw this little beauty! I haven't really tried any kind of hair styling powder before but I have definitely heard of it, so I thought I may as well give it a go. It's quite odd because it's a very fine powder like a bit of talc, but basically you shake a bit of it into the roots of your hair, give it a little rub, brush and style your hair an your done. Do not go crazy with it at little goes a VERY long way. It's quite odd because it makes your hair super gritty which gives a really nice lift to your hair but if you use a lot I am telling you now you will not be able to run your fingers through it. it gives you a back comb lift without actually having to backcomb your hair. Even waking up the next day, my hair still kinda looks ok which never happens for me. The problem I have now though is that when I don't use the XXL Plumping Powder, my hair looks so meh and boring so I find myself using it more and more. 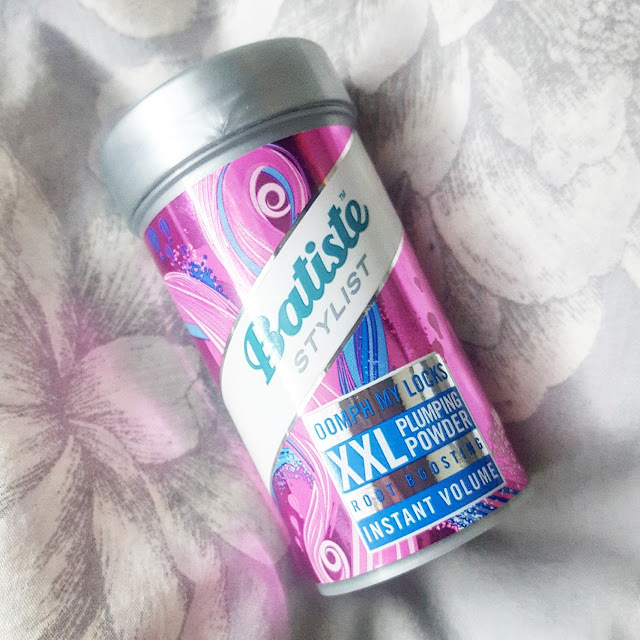 Batiste's XXL Plumping Powder really is a bit of a game changer for the people with flat hair, I think you could use it to create some really nice styles but I tend to use it a little more causally giving me a bit of "oomph" if I am going to see a pal, or going out for dinner. What are you fave products for adding more volume to your hair? I really want to give this a go but i've never got round to buying it. sounds like a nifty little product! i must admit my hair is pretty thick so adding to it would probably transform me into a lion! !